Once again, fluxiom has been updated, and it shows! Over the past few weeks, we have silently deployed one of the largest updates in fluxiom’s history, fully unleashing the power of our brand new distributed back-end. fluxiom may look the same at first glance, but what’s inside is entirely new. You will notice it is faster, smarter in its choices and clearer to interact with. This is also a retroactive update, meaning previously stored assets and existing accounts have been transparently re-visited to benefit from the improvements we are now announcing. 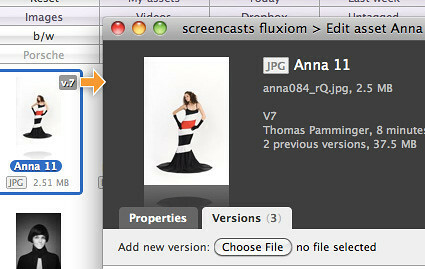 Uploading files, or even folders, is that easy with fluxiom and fluxUp!, its companion drag-and-drop uploader. Previews are generated and metadata is made searchable in seconds. Notice how new files appear transparently! We now recognise 97% of all assets stored on our system, meaning you can preview the contents of nearly all popular video and file formats on the market today, without downloading the files. And yes, we’re working hard on cracking the remaining 3%! We’ve dramatically improved the assets view, to allow video skimming right from the thumbnails, and to intelligently show information about the assets being displayed, based on the available screen real-estate. New background magic ensures your previews look their best at every zooming level, and appear on-screen faster. We now allow you to open a stage directly from your account, with no additional login, as soon as it has been created. This renders the stage previewing functionality obsolete, and it has been removed accordingly. Cosmetic improvements include a refined, clickable Versions badge, more reliable keyboard shortcuts and lighter generic icons for those (rare) files we can’t yet preview. If searching for metadata information has given you trouble in the past, we invite you to try again. A pesky bug affecting a small minority of files and even fewer users has been ruthlessly squashed. The service is fully available during the re-generation of the thumbnails, without restriction, but you may notice that your thumbnails are replaced by generic “file type” icons. This is no cause for concern, and simply means the system hasn’t fully refreshed your account yet. We expect everything to neatly finish over the weekend. Thank you for your continued support and your patience! Update: fluxiom is just back online after a scheduled maintenance and is now back with big improvements (more details soon). For a few weeks now, we have been promising great improvements to fluxiom in the fall, building upon the new back-end we have been setting up for you during the first part of 2009. Well, fall it is! After bringing on interface tweaks and new features, we are now ready to pulverise a few bottlenecks in our thumbnails and preview management system. On October 9 at 10:00 AM Vienna time (see in your time zone), our administrators will take fluxiom into maintenance mode for two hours, during which new servers will be sprung into action. Worry not, your data will be safe and sound, but we need to disconnect the network temporarily while the processing machines are being shuffled around. Around noon, fluxiom will be back with brand new code, and will start re-generating thumbnail previews for all your assets. As soon as it is brought back online, the service will be fully available to you and your users, without restriction, but you may notice that all your thumbnails aren’t here yet, replaced instead by generic “file type” icons: this is no cause for concern, and simply means the system hasn’t fully refreshed your account yet. Priority will be given to paying accounts, of course, and we expect everything to neatly finish over the week-end. Bandwidth-efficient thumbnail generation* — We now generate three sizes for each thumbnail, allowing us to present the best-looking and lightest possible file to the user. This speeds up the fluxiom interface dramatically, especially over slower connections, and makes for sharper, more beautiful images. 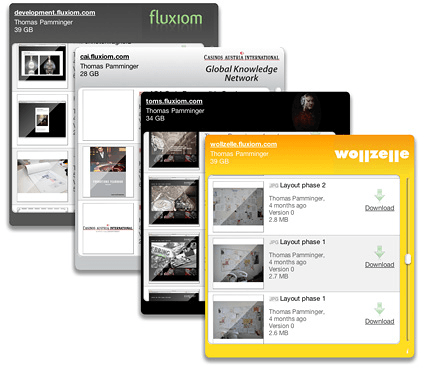 Super fast processing — Once the initial refresh is over, fluxiom will process your thumbnails up to 4 times faster, and this includes complex files. Video skimming — You can now see key frames of your video clips by hovering over their thumbnails right from the fluxiom interface. Video previews will also look sharper and behave better. Faster fluxUp! — Because fluxUp! is so tightly integrated with our processing system, it can now run up to 8 times faster in its default configuration. Finally, we will grab the occasion to improve the overall fluxiom interface, focusing on the behaviour of thumbnails and previews. There will be no unsettling change but a smooth improvement over what you already know and use, based on both user feedback and our internal usability reviews. As always, if you have any questions, please get in touch with our support specialists, who will be delighted to provide you with any additional information you may require. We appreciate your continued patronage, and are looking forwards to fluxin’ with you all on the new system. Those of you who manage lots of tags in your fluxiom account, or often update them to accompany project changes, should find the new interface more responsive, simpler to work with and overall more efficient. To rename a tag, simply click on it, enter its new name and confirm. To delete tags, just hit the convenient trash can icon sitting at the left end of every line. 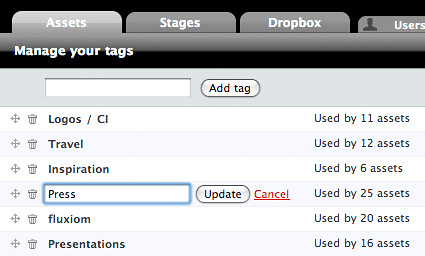 As always, you can re-order your tag bar by dragging and dropping list items in the order you prefer. Internet Explorer sure does grab a lot of headlines in the fluxiom world these days! With our recent news, some IE-enthusiasts have been wondering whether we were, in some way, phasing out our commitment to the Explorer product line altogether, and we wanted to put any such fears to rest immediately. Indeed, nothing could be further from our thoughts, and we remain as committed as ever to support all modern and popular browsers. In fact, as we are planning to phase out support for the grandfather of Explorers, Internet Explorer 6, we are delighted to announce we now officially support Internet Explorer 8, the latest and greatest addition to the family, which now comes standard on Windows PCs. Our operations team and designers has been busy over the past few weeks testing every nook and cranny of the fluxiom application on Internet Explorer 8, in both default and common configurations, to ensure it performs as smoothly and reliably as you expect. Support for IE8 has long been unofficial but, starting today, we are publicly committing to the browser and have added it to our list of recommended applications. This also means the little login warning has now gone the way of the dodo. Eight years later, the browser is officially a relic. Superseded in October 2006 by the radically different version 7, and then again last March by version 8, it has been declared dead many times over, as it should be. Indeed, for all the innovations it brought in its day and age, it is now incapable of rendering modern sites, and constitutes a serious security liability for those still using it. It served us well, but it has no place on the web of today. Following in the steps of many high-profile sites such as YouTube, MobileMe and Basecamp, fluxiom will progressively drop support for Internet Explorer 6, starting in the fall. Supporting Internet Explorer 6 currently prevents us from focusing our energies on last-generation web technologies, that would dramatically improve the fluxiom experience. It is also incompatible with many speed optimisations we are waiting to put into effect, meaning it effectively holds back our entire user base, which we find unacceptable. Finally, supporting Internet Explorer 6, and testing every part of the site on the browser, requires time and energy, which we cannot spend developing new features or improving existing ones. Here too, we feel this time is no longer wisely invested. Very few users still connect to the fluxiom application with Internet Explorer 6, and we will be pro-actively contacting those of you who still do to understand your particular circumstances. However, we know some of you are working with clients who have no choice in the matter, and do not want your usual workflow to be disrupted. This is why we will continue to support Internet Explorer 6 in upcoming public versions of the Dropboxes and Stages, meaning clients and partners of our users will be unaffected by the change. The versions they see may not be as full-featured or as advanced as the versions we will serve to other browsers but they will work reliably. If your own clients use Internet Explorer 6, Dropboxes and Stages will still work. We encourage you to educate those around you about the dangers of IE6, but there is no need to panic or to alter your workflow at the moment. Support remains unchanged. If you still use Internet Explorer 6 to access fluxiom.com or your fluxiom account, you will need to upgrade to a more modern browser to continue using the platform. We recommend Firefox, Safari or the newer versions of Internet Explorer. The adventurous amongst you will be pleased to know we also unofficially support Google Chrome. This means things should work well, but we cannot guarantee they will always do. As a general rule, it makes good computing sense to upgrade your browser swiftly as new versions are released. These updates are free, and contain important security patches. By upgrading your browser, you will enjoy not only a faster, more beautiful fluxiom, but you will enjoy a safer, more up-to-date view of the entire web. Many sites have already switched and are serving simpler, less interesting pages to Internet Explorer 6. New browsers also come with great tools that make browsing safer and more convenient. The transition will be progressive. We recommend that all users upgrade by October 1, 2009 but will update this post when support for Internet Explorer 6 is officially over. As always, we will keep an eye on statistics and ensure all of you are comfortable before we more full speed forwards. Update: On Mai 1, 2011, we discontinue the dashboard widget. This decision is consistent with our strategy to focus all of our software development resources on extending the web application. Thanks for your continuous support! Dashboard users rejoice, for an updated fluxiom widget is awaiting you. Release 0.92, hot from the ovens, and published only yesterday, brings a slew of back-end enhancements to the widget’s functionality. Most importantly, we have improved the download engine, to correct the error that prevented a few amongst you from actually downloading the assets (Whoopsie…). Additionally, the widget now works for both regular and SSL-enabled accounts, allowing you to connect to fluxiom regardless of the plan you have signed up for. At the push of a button, your assets are downloaded right to your Downloads folder, ready to be shared, dropped onto an iChat conference or into your favourite editing application. There are no messy names or extensions to be dealt with: what you stored is what you get back. Branding accounts is fun: with vibrant gradients and custom logos, fluxiom allows your brand to truly shine. In true fluxiom fashion, any widget connecting to your account will honour the brand settings you have set up for the fluxiom application itself, changing the widget’s entire appearance to fit smoothly with your colours and design of choice. How’s that for blending in? For more information about the widget, you can refer to our original announcement or download it directly to start playing. The widget currently requires Mac OS X v. 10.5 or later and API access must be enabled in your account. Up until very recently, that meant spending 89 euros on the Pro plan, and, for many amongst you, that just wasn’t gonna to happen. You also felt the unlimited log-ins to the administrative interface were way overkill. Well, we’ve heard you loud and clear! The Solo plan, fresh out of our ovens, features all the tools and storage a freelancer needs to conduct a booming business, but sheds the unlimited administrator log-ins. In doing so, it also sheds most of the overhead that led to the comparatively high price point of our Pro plan. Factor in our newly introduced storage re-calibration, and you’ve got yourself a sweet deal. We now offer 10 GB of secure fluxiom storage, 10 stages, in-file searching, custom branding, versioning support and SSL security. Only one administrator (you) can access the account, but he gets the full fluxiom extravaganza, meaning web access, our convenient fluxUp tool and any API-powered add-on he wishes to develop. Sign up at the usual place or upgrade your existing account in one click. Solo accounts are hooked up to the same high-availability, high-redundancy storage platform our enterprise plans feature, and live on the very same code base, lovingly cared for by our in-house administrators. We are honoured so many of you have decided to get their business started on fluxiom, and we know how much is at play for budding freelancers. We hope this new Solo plan will help you all get started on the best foot, and welcome any questions or feedback you may have. Basic and Pro users also get lots more stages — ten and twenty respectively. Hey, more storage means more files to share, right? It served you well, but you wanted more. All Deluxe users have been upgraded to Infinite One, a brand new plan featuring all the great features they know, sitting on top of a whopping 100 GB of storage — instead of the original 20 GB. Actually, it’s a family of plans, allowing enterprise or storage-intensive users to get a custom quote for any amount of storage they want. The sky is truly the limit: simply let us know what you want and our sysops will make it happen for you. We will also throw in unlimited everything, including unlimited stages. Has fluxiom gone mad? Not quite… We’re not going bankrupt either, and this isn’t a blowout sale. It just so happens the fluxiom platform has grown to the point where economies of scale are really kicking in, allowing us to offer lots more capacity for a much more competitive price. We are not offloading anything to shady third parties or using diskette arrays in the coat closet. With fluxiom, quality comes standard: every plan, from Free to Infinity is hooked to our highly redundant, secure architecture, the very one we have spent years tweaking and polishing, the same large corporations entrust with business-critical assets. You can get all the nitty-gritty on our Q&A page. What are you waiting for? The signup page awaits, and so does our support team should you have any questions, comments or concerns about this update. WebWorkerDaily is one of our favourite reads here at fluxiom, and one of the feeds we keep at all time in our aggregators. Not only is it a fun site to read, it provides an endless source of inspiration for our own workflow. While we don’t sign up for every service that launches, taking a breath and looking at one’s system with a clear eye is never a bad thing. Imagine our surprise this morning when an article popped up recommending a brand we are all familiar with! 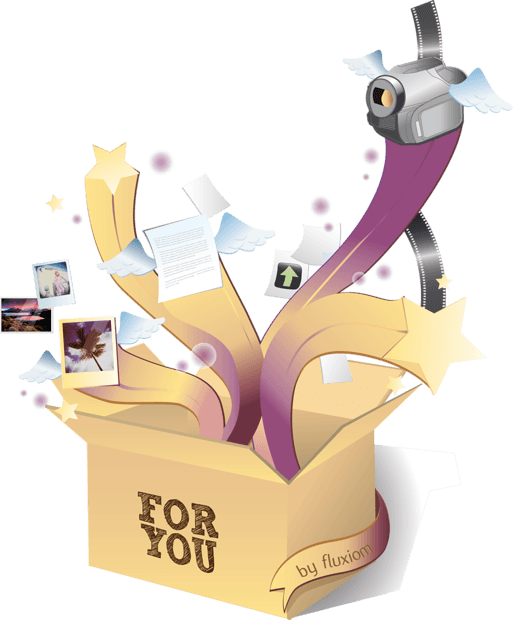 Indeed, Darrell Etherington has been kind enough to write a thorough review of fluxiom, highlighting recently-launched key features such as our free plan and the dropbox system . If you haven’t yet, we encourage you to give the post a read: his test cases and descriptions may give even long-time users ideas on how to use fluxiom to the fullest extent. Updated on June 15, 2009 — As planned, and as promised, the latest fluxiom update has now been successfully rolled out, and Safari 4.0 users should no longer see the message discussed below. Thanks for your trust, and keep on fluxin’! We are happy to announce that fluxiom is fully compatible with Safari 4.0 already, and that users can upgrade without worry. In fact, since Safari 4.0 contains a significant number of security enhancements, we recommend that all users upgrade as promptly as possible, personal computing situation permitting. On Monday, June 15, we will roll out a fluxiom upgrade that will further tailor the Safari browsing experience. Actually, we never stop turning the dials and buttons, tweaking and fine-tuning settings as browsers evolve. As always, please feel free to contact us with any questions or comments! Users who experience any strange behaviour with Safari are kindly invited to contact our support engineers, who will investigate the matter promptly. Since the introduction of the fluxiom free plan, we have had the pleasure of welcoming many students to our creative community. Making big dreams possible on a tight budget, and giving tools today to the talents of tomorrow, such is our goal. To those of you sitting on the fence, allow us to introduce Bastian Allgeier, who started investigating fluxiom on the day we launched, all the way back in 2006, and jumped on board the day free plans were introduced. Bastian is a student of web and graphic design in Mannheim, Germany. Today, he uses fluxiom to organise and back-up data on our advanced storage platform. As he gets into design business on his own, he’s also test-driving fluxiom stages as a way to distribute files and invite comments on long-term projects that come with uncertain deadlines and looser feedback loops. Like most dedicated graphic designers, Bastian likes his tools to look good and feel good: fluxiom’s breakthrough use of AJAX and desktop-quality interface seemed like a natural fit. He says fluxiom “highly inspired [him] to concentrate more on the development of web applications during [his] studies.” In fact, Bastian has already launched his first web application: colour us honoured! If you’re a student or a newcomer to the world of design, a “fluxiom free plan”https://secure.fluxiom.com/signup/free may be just what you need to get started. If you’re a professor, give us a ping, and we will gladly walk you through the process of setting up your class on fluxiom for free. Finally, whoever you are, we encourage you to look at Bastian’s portfolio. It’s sure to entertain and inspire! Are you using fluxiom too? Then send us an email to support@fluxiom.com or tweet @fluxiom to let us know. We’re always on the look-out for fresh ideas and suggestions. Managing information and access rights within a company is always tricky. On the one hand, it is necessary to grant everyone enough access for them to perform the work they have been assigned and feel comfortable in the process. On the other, being too generous with permissions could lead to the unwanted disclosure of sensitive data or, mundanely, to unnecessary confusion. That’s why some of our users have been asking for a new feature in fluxiom: the ability to create read-only users, who could be allowed into a fluxiom account and given access to the full fluxiom catalogue, but without being able to alter the account or download the assets it contains. 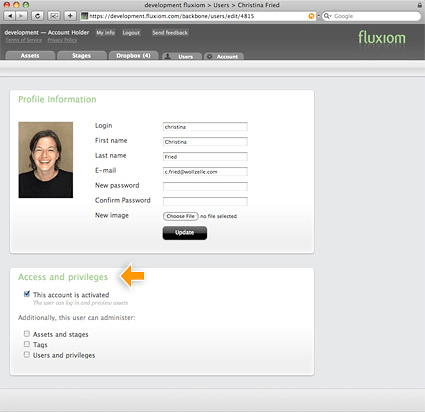 To create these users, simply log in to fluxiom, and click on the “Users” tab, as you usually do to manage access rights. Upon creating a new user, you can now restrict its rights by un-checking the “Administer assets and stages” box, but leaving the account itself enabled. Since it makes sense for most users to administer the assets stored into an account, this privilege is still granted by default, as in the past. Of course, you can edit your current users in a similar fashion to apply finer-grained restrictions to your existing base — no need to re-create accounts: simply click on the “Edit” link in their profile card. The “Users” tab has been slightly redesigned to reflect these finer-grained access controls. If you’ve been using stages to grant limited access to users within your company, you can now merge them cleanly with the remainder of your employees, and grant them the many benefits of direct access to fluxiom, including a smooth upgrade path towards additional access to the system. 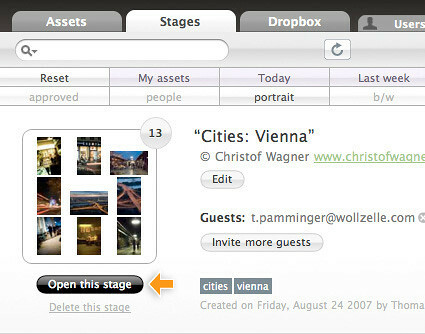 Do note that this new feature does not in any way signal the disappearance of stages, that are the preferred way to share information with clients and partners outside your company: not only do stages feature a simplified interface that is better suited to sharing, they can also be fully branded with your own logo and corporate colours. You can read a full summary of the feature in our updated help documents. As always, we hope you enjoy this new feature, and will be welcoming your thoughts, comments and ideas on both form and function. All feedback is always welcome! 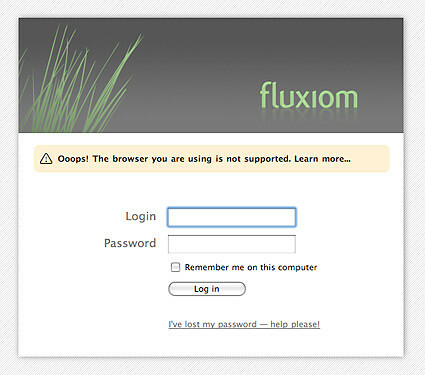 Fluxiom will be unavailable for around 30 minutes on Wednesday, April 15, 2009, 7am GMT for system maintenance. Thanks for your patience while we continue to improve fluxiom for you. Be the first to read about updates, announcements and system status over at our twitter stream or visit our status page http://status.fluxiom.com. 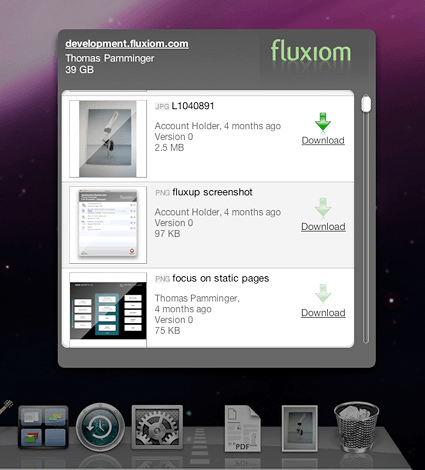 Update, April 15, 2009: fluxiom is up and running again. Thanks for your patience! Environment: Your files are stored in enterprise-grade data centres, monitored 24×7×366 by specialists for environmental stability. Biometric checks, video surveillance and locked cages are but a few of the layered measures that keep your files away from prying hands. Security: Our servers are connected to battery-backed power as well as to n +1 redundant generators in the unlikely event of a prolonged outage. Fire retardant walls, early-warning smoke detectors and gas-release fire suppressant systems stand ready to quench any trouble before it starts. Hardware: Your data is processed and stored exclusively on high-end hardware from Apple and Promise, the storage specialists, for optimal speeds and resiliency. Backups: Data is backed up to yet another RAID array throughout the day, allowing for speedy recovery from even statistically improbable hardware failures. Finally, our primary set-up is backed up to a geographically remote location every single night, just in case a meteorite were to crush the original one. Readiness: All your data is stored redundantly on duplicate hardware, and we keep spare parts for all critical network equipment. Our data centres are manned around the clock, meaning most repairs can be effected in a matter of minutes. Connectivity: Both our data centres are linked directly to the Vienna Internet Exchange, a high-performance, high-availability Internet Exchange Point founded and operated by the University of Vienna since 1996. It offers unparalleled connectivity with an outstanding availability track-record. Monitoring: Our early warning system immediately notifies engineers of slowdowns and erratic behaviour, meaning we can respond to most difficulties before they impact our users. Any error condition within the platform is automatically reported to our QA team for further manual analysis. 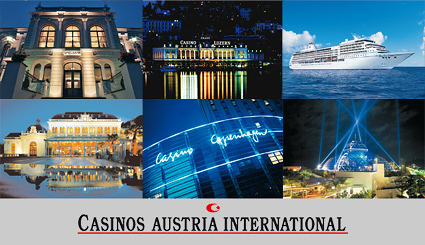 That’s why we at fluxiom are thrilled to work with Casinos Austria International (CAI), a leading player in the international gaming industry. The company decided to migrate part of its infrastructure to fluxiom back in 2006, and has been expanding its reliance on the system ever since, thereby proving the value and pertinence of “software as a service,” even in a traditional corporate setting. Dubbed the “Global Knowledge Network” within the company (thanks to fluxiom’s white label feature), it is now an essential cog in a well-oiled work-flow. Project leads at Casinos Austria International have kindly allowed us to publish a case study featuring their process in greater detail. We hope this interview provides you with fresh ideas to push the fluxiom envelope in your own business, and contributes to convincing your reluctant boss or co-workers to give fluxiom — and other Web-based tools — a serious try. Remember, our free plan is a good way to get started without tapping into your department’s budget. Are you using fluxiom in an enterprise setting, too? In the meantime, you can read the case study.